ON JULY 28th in Washington D.C., the capital of the United States, the Organization of American States held the “Master Wan Ko Yee (H.H. Dorje Chang Buddha III) Yun Sculpture Exhibition.” This exhibition was mainly directed at ambassadors from various countries, United States senators and congresspersons, and high-level government officials in the White House. The Organization of American States is a world organization that is composed of 34 countries, including the Unites States, Canada, and Mexico. The Secretary General of the Organization of American States is selected from the presidents of the various member countries. The present Secretary General Is Cesar Gaviria, President of Columbia. After that organization communicated many times with the Master Yi Yungao International Cultural Institute, and after much effort, the Organization of American States came to have a thorough understanding of Master Wan Ko Yee (H.H. Dorje Chang Buddha III) and came to recognize him. 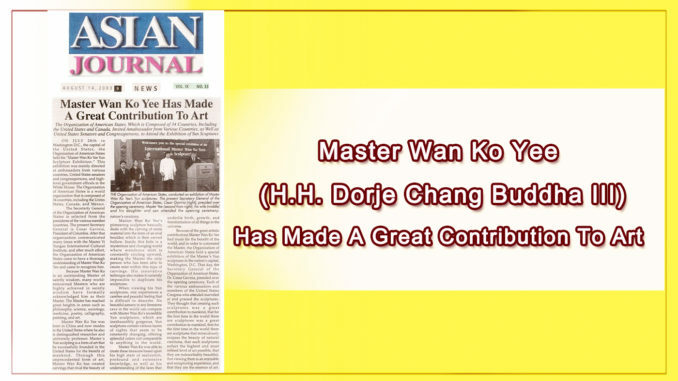 Because Master Wan Ko is an outstanding Master of saintly wisdom, many world renowned Masters who are highly achieved In saintly wisdom have formally acknowledged him as their Master. The Master has reached great heights in areas such as philosophy, science, sociology, medicine, poetry, calligraphy, painting, and art. Master Wan Ko Yee (H.H. 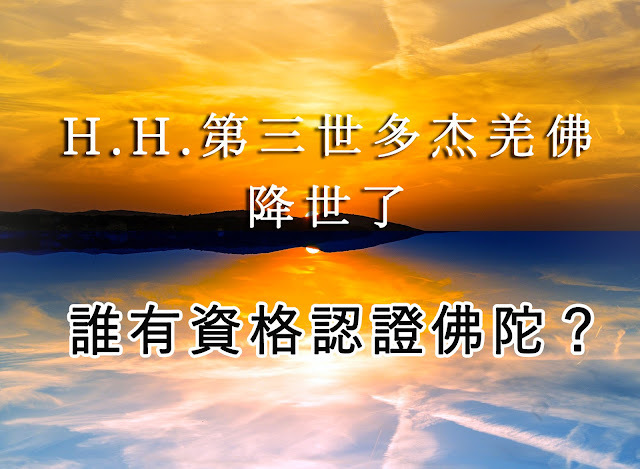 Dorje Chang Buddha III) was born in China and now resides in the United States where he also is distinguished researcher and university professor. Master’s Yun sculpting is a form of art that he successfully founded in the United States for the benefit of mankind. Through this unprecedented form of art, Master Wan Ko has created carvings that rival the beauty of nature’s creations. 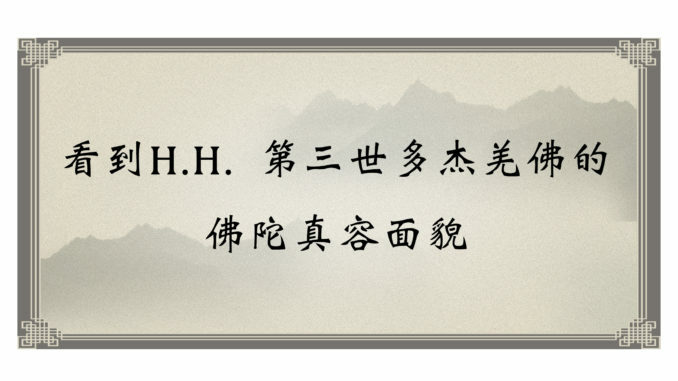 Master Wan Ko Yee’s (H.H. Dorje Chang Buddha III) pioneering sculpture basically deals with the carving of stone material into the form of an oval boulder, which is then carved hollow. Inside this hole is a mysterious and changing world where wondrous mist is constantly circling upward, making the Master the only person who has been able to create mist within this type of carvings. His innovative technique also makes it currently impossible to duplicate his sculptures. When viewing his Yun sculptures. one experiences a carefree and peaceful feeling that is difficult to describe. No beautiful scenery in any limestone cave in the world can compare with Master Wan Ko’s incredible Yun sculptures, which are inexhaustibly gorgeous. Yun sculptures contain various layers of sights that seem to be constantly changing, offering splendid colors not comparable to anything in the world. Master Wan Ko was able to create these treasures based upon his high state of realization, profound and extensive knowledge, as well as his understanding of the laws that underlie birth, growth, and transformation of all things in the universe. 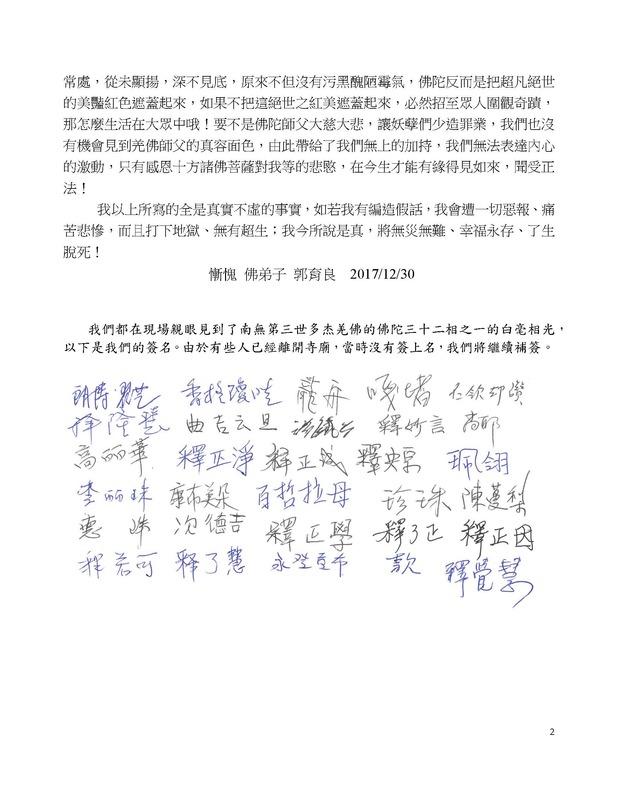 Because of the great artistic contributions Master Wan Ko Yee (H.H. Dorje Chang Buddha III) had made for the benefit of the world, and in order to commend the Master, the Organization of American States held a special exhibition of the Master’s Yun sculptures in the nation’s capital, Washington, D.C. That day, the Secretary General of the Organization of American States, Dr. Cesar Gaviria, presided over the opening ceremony. Each of the various ambassadors and members of the United States Congress who attended marveled at and praised the sculptures. They thought that creating such sculptures was a great contribution to mankind, that for the first time in the world there are sculptures was a great contribution to mankind, that for the first time in the world there are sculptures that miraculously surpass the beauty of natural creations, that such sculptures reflect the highest and most refined level of art possible, that they are indescribably beautiful, that viewing them is an enjoyable and enrapturing experience, and that they are the essence of art. 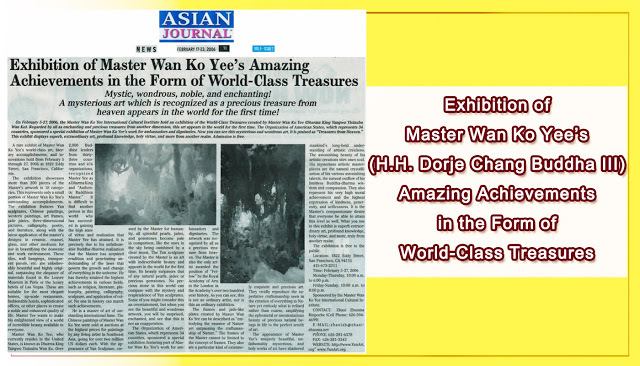 THE Organization of American States, conducted on a exhibition of Master Won Ko Yee’s (H.H. Dorje Chang Buddha III) Yun sculptures. The present Secretory General of the Organization of American States, Cesar Gaviria (right), presided over the opening ceremony. Master Yee (second from right), his wife (middle) and his daughter and son attended the opening ceremony. Mystic, wondrous, noble, and enchanting! heaven appears in the world for the first time! On February 5-27, 2006, the Master Wan KoYee (H.H. 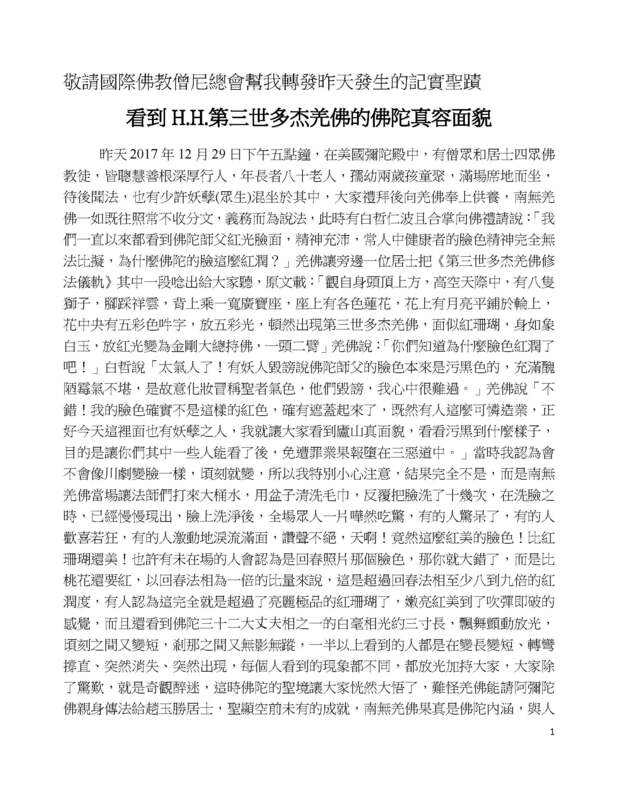 Dorje Chang Buddha III) International Cultural Institute hold an exhibition of the World-Class Treasures created by Master Wan Ko Yee(Dharma King Yangwo Yisinubu Wan Ko). Regarded by all as enchanting and precious treasures from another dimension, this art appears in the world for the first time. The Organization of American States, which represents 34 countries, sponsored a special exhibition of Master Wan Ko Yee’s work for ambassadors and dignitaries. Now you can see this mysterious and wondrous art. It is praised as “Treasures from Heaven.” This exhibit displays superb, extraordinary art, profound knowledge, holy virtue and more from another realm. Admission is free. 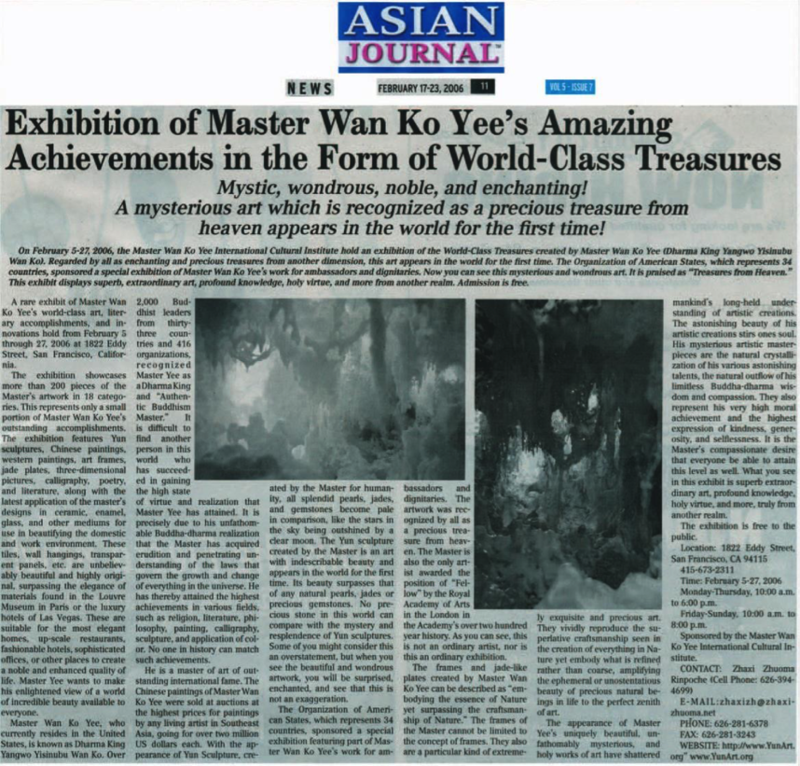 A rare exhibit of Master Wan Ko Yee's (H.H. Dorje Chang Buddha III) world-class art, literary accomplishments, and innovations hold from February 5 through 27, 2006 at 1822 Eddy Street, San Francisco, California. The exhibition showcases more than 200 pieces of the Master's artwork in 18 categories. This represents only a small portion of Master Wan Ko Yee's (H.H. Dorje Chang Buddha III) outstanding accomplishments. 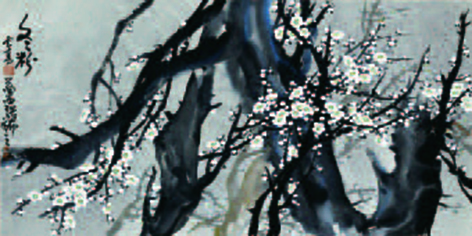 The exhibition features Yun sculptures, Chinese paintings, western paintings, art frames, jade plates, three-dimensional pictures, calligraphy, poetry, and literature, along with the latest application of the master's designs in ceramic, enamel, glass, and other mediums for use in beautifying the domestic and work environment. These tiles, wall hangings, transparent panels, etc. are unbelievably beautiful and highly original, surpassing the elegance of materials found in the Louvre Museum in Paris or the luxury hotels of Las Vegas. These are suitable for the most elegant homes, up-scale restaurants, fashionable hotels, sophisticated offices, or other places to create a noble and enhanced quality of life. Master Yee wants to make his enlightened view of a world of incredible beauty available to everyone. Master Wan Ko Yee (H.H. Dorje Chang BuddhaIII), who currently resides in the United States, is known as Dharma King Yangwo Yisinubu Wan Ko (H.H. Dorje Chang Buddha III). Over 2,000 Buddhist leaders from thirty three countries and 416 organizations, recognized Master Yee as a Dharma King and "Authentic Buddhism Master." it is difficult to find another person in this world who has succeeded in gaining the high state of virtue and realization that Master Yee has attained. It is precisely due to his unfathomable Buddha-dharma realization that the Master has acquired erudition and penetrating understanding of the laws that govern the growth and change of everything in the universe. He has thereby attained the highest achievements in various fields, such as religion, literature, philosophy, painting, calligraphy, sculpture, and application of color. No one in history can match such achievements. He is a master of art of outstanding international fame. The Chinese paintings of Master Wan Ko Yee (H.H. Dorje Chang Buddha III) were sold at auction at the highest prices for paintings by any living artist in Southeast Asia, going for over two million US dollars each. 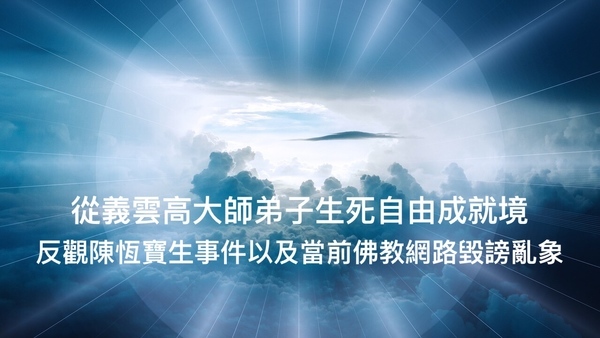 With the appearance of Yun Sculpture, created by the Master for humanity, all splendid pearls, jades, and gemstones become pale in comparison, like the stars in the sky being outshined by a clear moon. The Yun sculpture created by the Master is an art with indescribable beauty and appears in the world for the first time. Its beauty surpasses that of any natural pearls, jades or precious gemstones. No precious stone in this world can compare with the mystery and resplendence of Yun sculptures. Some of you might consider this an overstatement, but when you see the beautiful and wondrous artwork, you will be surprised, enchanted, and see that this is not an exaggeration. The organization of American States, which represents 34 countries, sponsored a special exhibition featuring part of Master Wan Ko Yee’s work for ambassadors and dignitaries. The artwork was recognized by all as a precious treasure from heaven. The Master is also the only artist awarded the position of "Fellow" by the Royal Academy of Arts in the London in the Academy’s over two hundred year history. As you can see, this is not an ordinary artist, nor is this an ordinary exhibition. The frames and jade-like plates created by Master Wan Ko Yee (H.H. Dorje Chang Buddha III) can be described as “embodying the essence of Nature yet surpassing the craftsmanship of Nature.” The frames of the Master cannot be limited to the concept of frames. They also are a particular kind of extremely exquisite and precious art. They vividly reproduce the superlative craftsmanship seen in the creation of everything in Nature yet embody what is refined rather than coarse, amplifying the ephemeral or unostentatious beauty of precious natural beings in life to the perfect zenith of art. The appearance of Master Yee’s uniquely beautiful, unfathomably mysterious, and holy works of art have shattered mankind’s long-held understanding of artistic creations. The astonishing beauty of his artistic creations stirs once soul. His mysterious artistic masterpieces are the natural crystallization of his various astonishing talents, the natural outflow of his limitless Buddha-dharma wisdom and compassion. They also represent his very high moral achievement and the highest expression of kindness, generosity, and selflessness. It is the Master’s compassionate desire that everyone be able to attain this level as well. What you see in this exhibit is superb extraordinary art, profound knowledge, holy virtue, and more, truly from another realm.